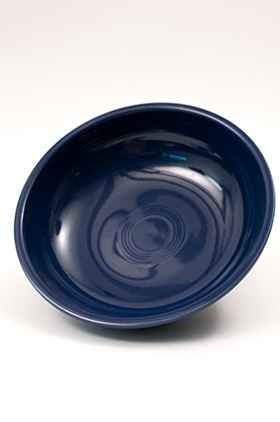 Circa: 1937-1946: The widest of all the bowls in the entire Vintage Fiesta dinnerware line, the 11 3/4" fruit bowl is a delight to find in cobalt without damage, use, wear or glaze irregularities. 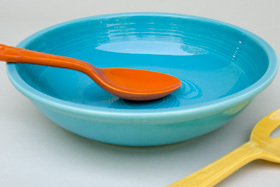 Originally intented to be used with the Kitchen Kraft fork and spoon set, the large 11 3/4" Vintage Fiesta fruit bowl is a delight to use with your mix and match table settings. Circa: 1937 - 1946. 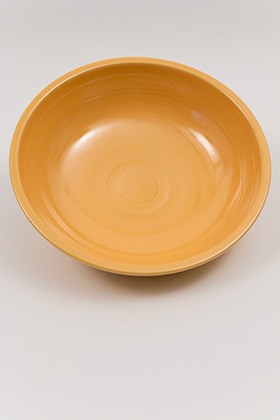 The large, shallow fruit bowl was originally designed as part of the Kitchen Kraft line. The large fruit bowl will delight the collector with its great size and usuable form. Circa: 1937 - 1946. 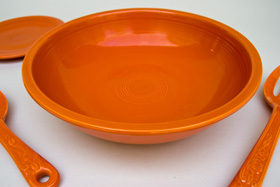 The large, shallow fruit bowl was originally designed as part of the Kitchen Kraft line, to be used with the kitchen kraft fork and spoon. The large fruit bowl will delight the collector with its great size and usuable form. Circa: 1937 - 1946. 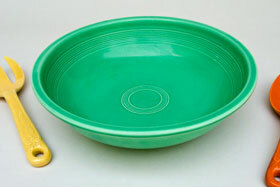 The large fruit bowl was originally designed as part of the Kitchen Kraft line. 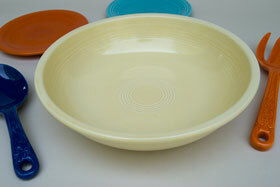 The large fruit bowl will delight the collector with its great size and usuable form.